On the occasion of the Formula 1 Grand Prix that will be taking place over the weekend in Monza, as usual Magneti Marelli will be opening the doors of its permanent “Giuseppe Valpreda” Hospitality area with various initiatives. In particular, this year the presence of Magneti Marelli is characterised by the theme "From Track to Road, from Virtual to Real" that aims to explore the technological connections between the world of the track and that of the road and also the new virtual dynamics related to the Internet and to social protocols that are able to stimulate technological innovation within the company. In this sense, the protagonist will be LapTime Club, the online innovation laboratory of Magneti Marelli Motorsport, that through the aggregation tool of social networks aims to stimulate the generation of new ideas and technological solutions, addressing a public of university students and fans of motorsport technology. There are two major initiatives. The first is "LapTime Club: live in Monza" and involves the live conclusion of the virtual challenge launched last month on LapTime Club (http://www.laptimeclub.com) entitled «In 2015, International Year of the Light, and on the bidirectional thread of the theme "from Track to Road," we ask you for possible applications of lighting technologies in the motorsport world both for safety reasons and for pure entertainment». Through the "Elevator Pitch" formula (five minutes for participants to present their ideas), the five best ideas communicated via the Magneti Marelli online channels selected by a pool of Magneti Marelli experts will compete live on the Hospitality stage. The second initiative of the LapTime Club is called "Tweet your idea" and will involve the public in attendance at Monza on Friday and Saturday. Within the Magneti Marelli Hospitality area it will be possible to obtain the initiative postcard on the theme: «Thanks to technological innovations, the world of Motorsport is experimenting with new ways to engage the public. How would you improve the quality of the show in racing both on television and live?». In this case, the challenge for the public will be to condense their ideas in a tweet of no more than 140 characters. The "Telemetry LapTime Game" provides a space for entertainment and is a simulator that uses the Magneti Marelli Motorsport telemetry tool and measures "driver" performance at three different points of the Monza circuit: The Start Line, the “Prima Variante” and the “Parabolica”. 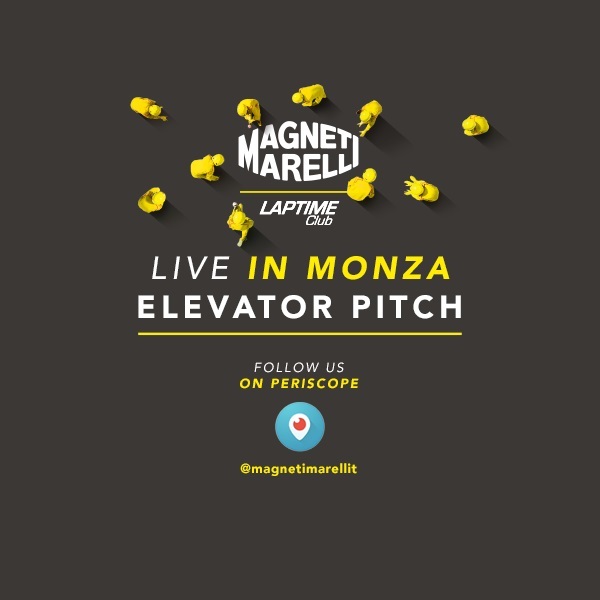 Throughout the Monza event, it is possible to participate in the “Magneti Marelli Tech & Racing Quiz”, a game that will engage “live” the public and will test their skills relating to the motorsport and automotive area with questions on the technologies and, regarding general culture, on competitions. The theme "from Track to Road, from Virtual to Real" also translates concretely with the presentation, within the Hospitality area, of the Magneti Marelli technologies relating to Motorsport and to standard production. Among these, the advanced Magneti Marelli telemetry system supplied to nearly all the F1 teams. Cutting-edge solutions will also be exhibited, such as the Fast Camera, capable of capturing 400 frames per second, which will be introduced next year to improve passive safety in F1. Other solutions include the ERS H-K system (Heat Energy Recovery System and Kinetic Energy Recovery System), the electric gear actuator and the GDI system with injectors and 500-bar pumps. For applications intended for standard production vehicles the Magneti Marelli powertrain solutions with the GDI 600-bar system, telematics with different applications of the TBOX (telematic box) and components for electric/hybrid cars will be presented with unveiling of a complete hybrid engine. Finally, in the outdoor Hospitality area, Sebastian Vettel's Ferrari F1, Valentino Rossi's Yamaha M1 and the Citroën DS3 WRC used by Tony Cairoli will be exhibited.